Villa Ocean’s Edge is a two-storey, beachfront vacation residence that embodies period architecture and design. With a coordinated white and wood color scheme, interiors are appointed with mostly elaborate and weathered wood furnishings and fixtures accompanied by beautifully crafted, woven wood as well as contemporary and lavish pieces. 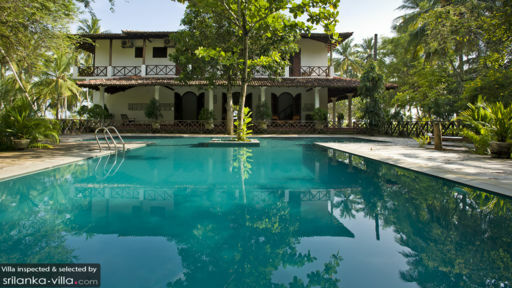 Amenities are, at once, deliberately first rate – to assure each and every guest’s absolute convenience and diversion. Truly, Villa Ocean’s Edge accords you genteel vacation living with a nostalgic and coastal air. The villa has four air-conditioned bedrooms. Three of these are on the second floor. These bedrooms all have canopied and draped queen-sized beds. Although one of these bedrooms also has an additional single bed in a connecting annex. All three bedrooms open out to a long, shared balcony overlooking the swimming area, the expansive garden’s well-kept lawn and tall palm trees, as well as the golden coastline. One more air-conditioned bedroom, on the ground floor, has a canopied and draped single bed. All bedrooms have dedicated bathrooms with rain showers. 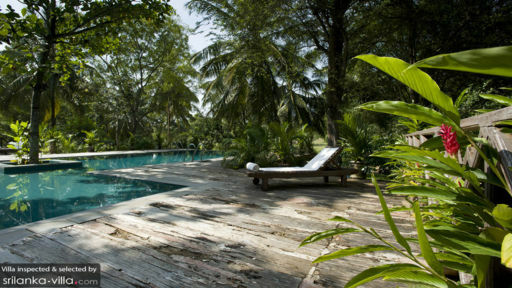 Adjacent to the villa’s beachfront covered terrace is the 15-meter, T-shaped swimming pool. Dip into its alluring, crystal clear waters for some aimless wading, or for some playful splashing. If you wish to bathe, instead, in the sun, you can laze on cushioned, wooden pool beds partially shaded by trees on the poolside stone deck, or on elaborate woven wood chairs out on the beach. On the villa’s spacious and airy ground floor is the living area with its long, cushioned, fitted couches. Here, you can all assemble for amusing and animated sharing and storytelling. Out on the covered terrace of the villa’s façade is the alfresco dining area. On its timber wood table for eight, you can all feast on authentic Sri-Lankan cuisine – as well as your most requested comfort food – concocted by the in-house chef at the well-equipped, modern kitchen in another room on one end of the ground floor. Adjacent to the living area is a TV room where you can all catch shows you’ve been closely following. Or, where you can watch, for the nth instance, your all-time, favorite classic film. On the covered terraces of the villa’s façade and beachfront are sitting areas where you can spend some alone time. Assigned to attend to the villa’s daily services is a staff composed of mostly housekeepers. In addition to the chef, a driver and a laundry helper may, upon your request, be called in. However, their services will be charged separately. Car rental is also available. 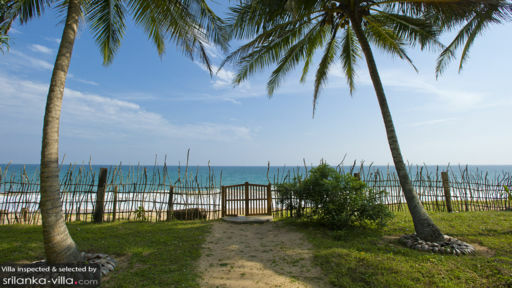 Villa Ocean’s Edge is based in the lazy town of Tangalle. Spend a day at Medaketiya Bay where you can get your saltwater fix. On another day out, go on a trek to Mulkirgala – a rock temple with Buddha statues, caves with paintings, as well as palm-leaf manuscripts that served as the key to translating the Mahawamsa or the Great Chronicle of Sri Lanka.